The nine months from 1 July 2014 to 1 April 2015 have been unprecedented in terms of low rainfall and frequency of falls since we started our holistic grazing program in 2000. What sets this period apart from the same time span in other years has been failure of a significant rainfall (over 60mm) event in early summer or in early autumn. For the first time a flush of summer active perennial grass growth did not happen, so pasture availability relied on the bank grown in spring. Our spring pasture growth was, despite the below average rainfall since 1 July 2014, close to as prolific as in average rainfall years. 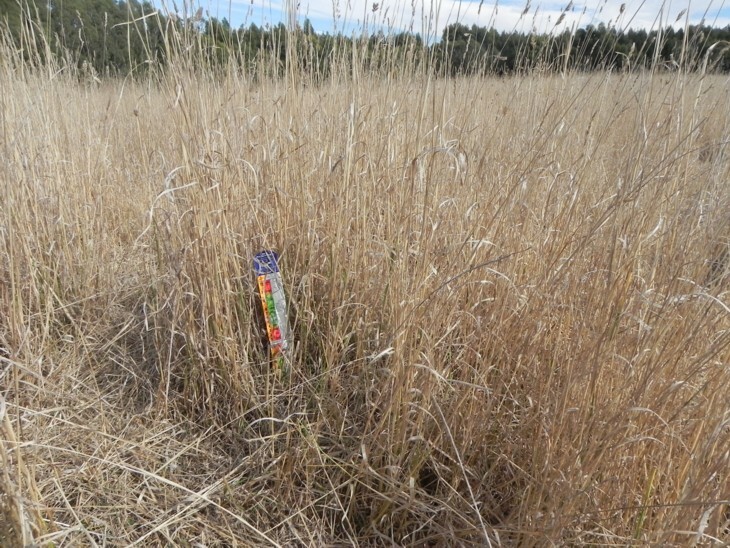 Depending on where the paddock was in the grazing rotation on 1 December 2014, paddocks’ pasture herbage (including green leaf) varied between 3000 and 6000kg of dry matter per hectare. I estimated about 66% of the herbage was edible leaf with the remaining 33% inedible stem. These levels of herbage turned out to be an incredibly valuable asset in late summer and autumn and demonstrate how holistic grazing contributes to a resilient pasture supply for livestock and a resilient environment protecting and maintaining ecosystem services. In contrast, many district farms are now bare of pasture cover and soil is exposed to degrading processes and loss of biodiversity. 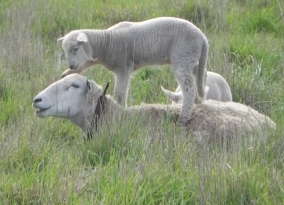 The large quantity of pasture grown in spring ensured we could continue to maintain breeding ewes and weaned ewe lambs on pasture without supplementary feeding. Most livestock farmers in the district are feeding hay and silage to maintain cattle herds and sheep flocks, many resorting to purchasing fodder as stores of home grown feed disappear. What’s more with pastures so badly eaten out, their recovery with late autumn rain will be slow as frosts and cold weather set in. These farmers will need to continue feeding livestock right through to mid spring. The other serious consequence of eating pastures to the ground and the pastures constant exposure to grazing over many months is perennial plant death. When autumn rain does come, it will be the annual weeds and grasses which respond quickly. 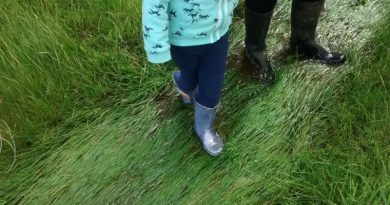 With no or little competition from perennial grasses annual weeds and grasses (barley, silver, and onion grass) will dominate ground cover, further lowering the resilience of the pasture ecosystem next summer. In dry summer-autumns it is common to see pastures eaten below 1000 kg herbage per hectare. 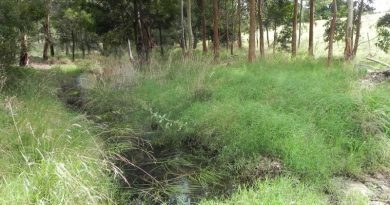 Not only do they fail livestock nutrition the ecosystem function of the paddock is seriously compromised. Photo: Patrick Francis. 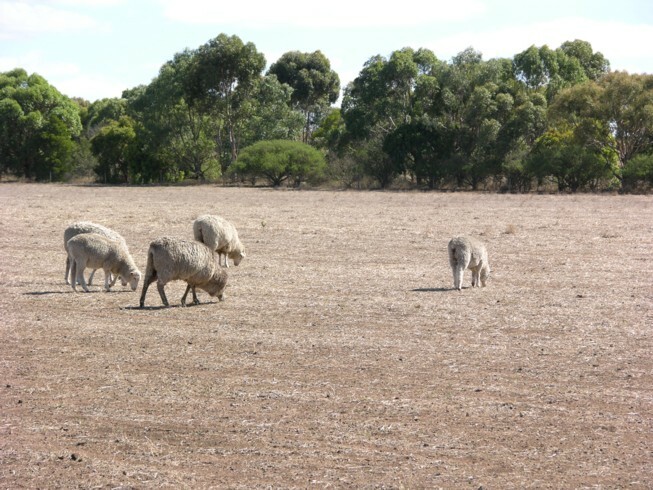 When summer thunderstorms failed to eventuate by late January we made the decision to start supplementing our 2014 drop wether lambs to ensure they would continue to grow to meet carcase specifications for Moffitts Farm Natural sheepmeat being sold in the Small Produce Store in Melbourne. 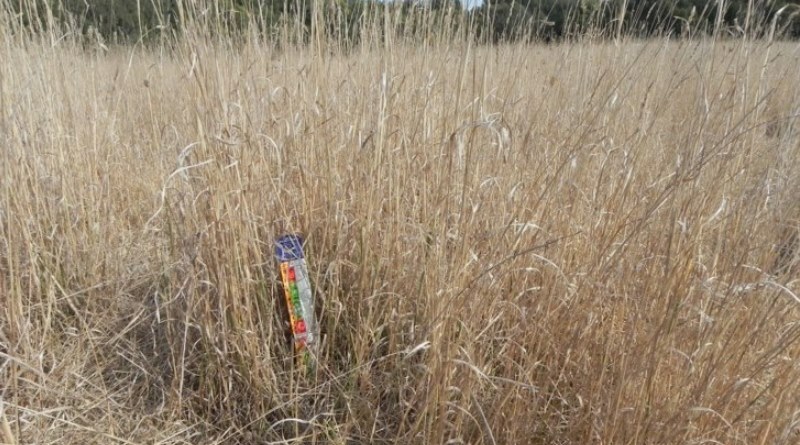 By the end of January, soil moisture level was so low that the summer active perennials were no longer re-growing during the rest period after grazing. It meant spring drop weaners were shifting into pastures that had bulk leaf matter but its protein, energy and digestibility were declining to levels which would not meet their requirements to grow to our target 45 – 50 kg live weight within the required timeframe.. In the summer of 2013/14 we had a similar low rainfall situation affecting pasture for wether lambs and we supplemented their pasture intake with lamb pellets (16% protein , 11mg/kg metabolisable energy) using an Advantage lick feeder. While the system worked well and lambs put on weight, I was not happy with the failure of the lamb grower pellet manufacturer to declare what specific ingredients were included in each batch of pellets. In particular I wanted to know the source of the canola meal, whether it was from GM or non GM seed. The manufacturer refused my requests to answer this question. As we will not feed our lambs GM canola and growth promoting compounds and cannot find a manufacturer who can supply a guarantee to this effect, we do not feed pellets. There was also a practical issue with feeding pellets in a lick feeder. The moisture from the lambs’ tongues degrades some of the pellets in the licking slot and it eventually clogs up and needs regular cleaning. The degraded pellets also attract flies. Feed oats or barley while variable in nutrient content, avoid all the issues associated with pellets. Their problem is high cost when you are not involved in bulk handling and purchasing truck loads at a time. Grains can have an issue with lack of transparency regarding nutrient composition. Even branded bags of oats and barley do not carry protein and energy content labels. We have asked for this data but have been told by the companies we would have to pay for the Feedtest ourselves. 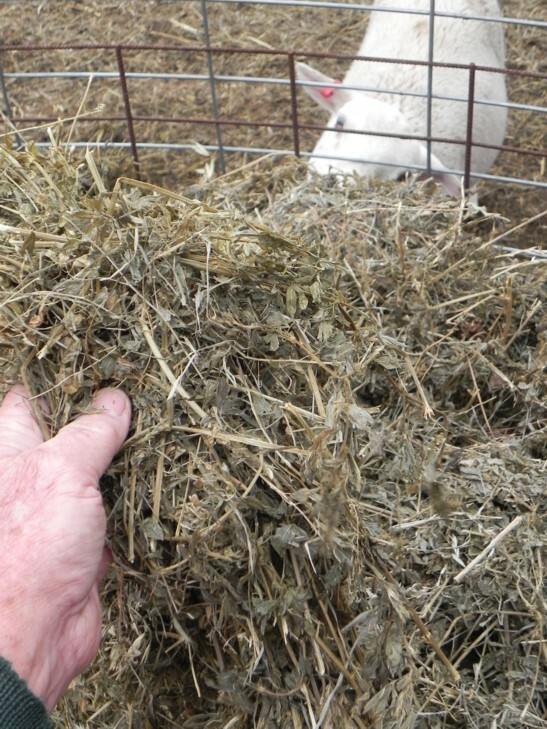 Our solution for 2015 lamb finishing during the dry summer-autumn is lucerne silage. After attending a Victorian Department of Primary Industries seminar on lamb finishing in November where the topic of silage was briefly mentioned, we did some literature research on the topic. The NSW Department of Primary Industries has published a review of silage feeding (http://www.dpi.nsw.gov.au/agriculture/field/pastures/silage/successful-silage ) which showed encouraging results. We were fortunate to find a local farmer who makes large quantities of round bale lucerne silage of exceptionally high quality, table 1. 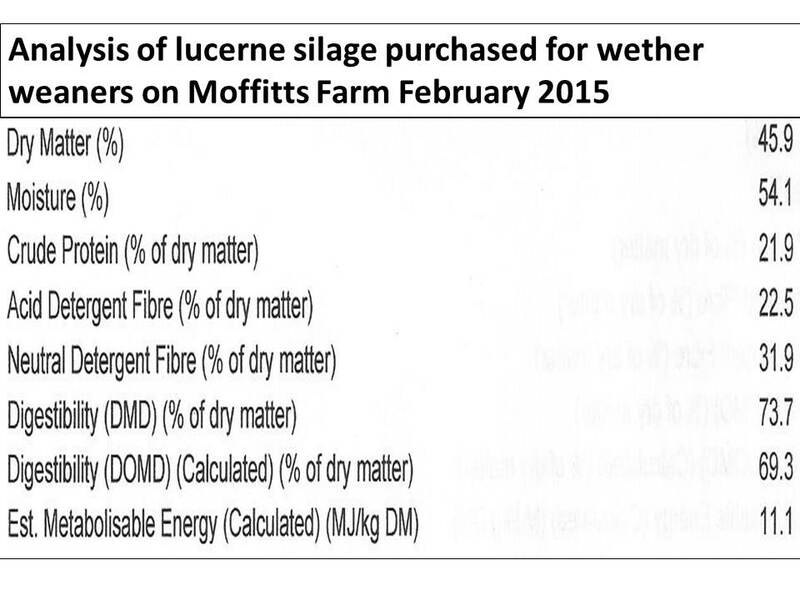 Table 1: Lucerne silage analysis for rolls being fed to wether lambs. Our experience with lucerne silage has been good. While lambs can be difficult to move onto supplements like pellets or oats in a feeder, there was no difficulty attracting them to the silage. As well, with pellets or grains, acidosis can be a problem in some lambs even with careful feed management. Acidosis is not an issue with lucerne silage. All lambs quickly took to eating silage and its palitibility is so high we have to restrict its access to a few hours each day. We still want lambs to be consuming the bulk of their diet as pasture, the silage is provided as a source of protein and energy so the rumen can better utilse the pasture dry matter. Lucerne silage is a highly palitible feed for weaned lambs and is rationed to animals on pasture which lacks sufficient protein and energy for optimum growth to meet market specifications. Photo: Patrick Francis.